Since I crossed the border of Thailand into Malaysia by land, I have not been asked to prove nor were any permits handed over to me. Nonetheless certain documents are required to drive a foreign registered vehicle in Malaysia legally and hence I like to give you some hints to avoid any hassle with the customs. Please feel free to interpret some of my sentences and/or leave a comment. The following private documents may not be used for your own purposes! Most nationalities get a free of charge 90 day On-Arrival visa for Malaysia at any border. The same period applies to their vehicles as well. Malaysia is a ATA Carnet de Passage country. As far as I know, most travelers were only asked to get their Carnet stamped at the ports customs, either they shipped in or out. Of course, you can get your Carnet stamped at any border! An vehicle insurance is mandatory in Malaysia and it is illegal to drive without. 1. At the land borders to Thailand it is very likely that you pass a small ALLIANZ Insurance booth just after your crossing. This is the only known company who insures foreign vehicles for a period of 3 months but ONLY at the borders. Here, a very simple 3rd Party Insurance for a VW T3 Syncro was at around 50$, in 2016. 2. In Putrajaya, in the building of the MOT (Ministry of Transport / JPJ), you find an insurance broker (eTiQa) who will only provide you an insurance for 12 months. 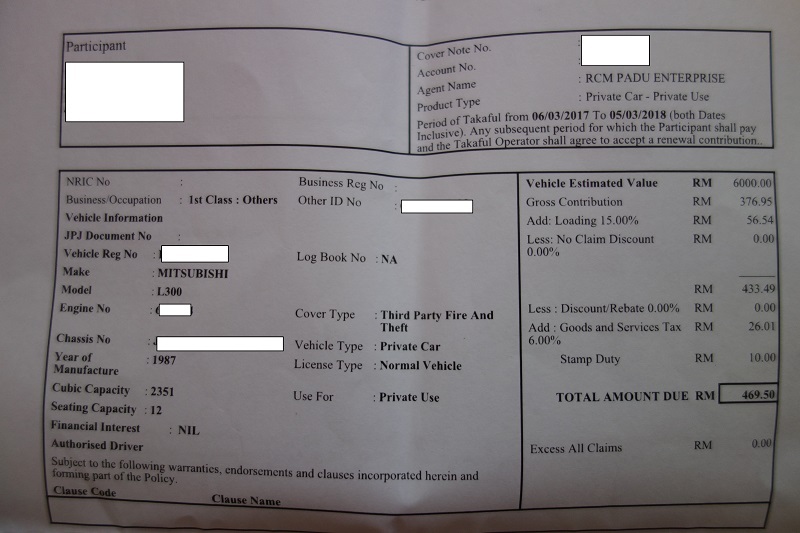 A 3rd Party Insurance, including Fire and Theft, with an estimated vehicle value of 6000 RM was issued to me in 2017 for 469,50 RM, around 120 $. 3. I do not know anything about the charges of the Automobile Association of Malaysia (AAM) in Shah Alam, nearby Kuala Lumpur, but they are also able to supply an insurance, even within 30 minutes. An ICP (see below) and a stamped Carnet is here definitely required. 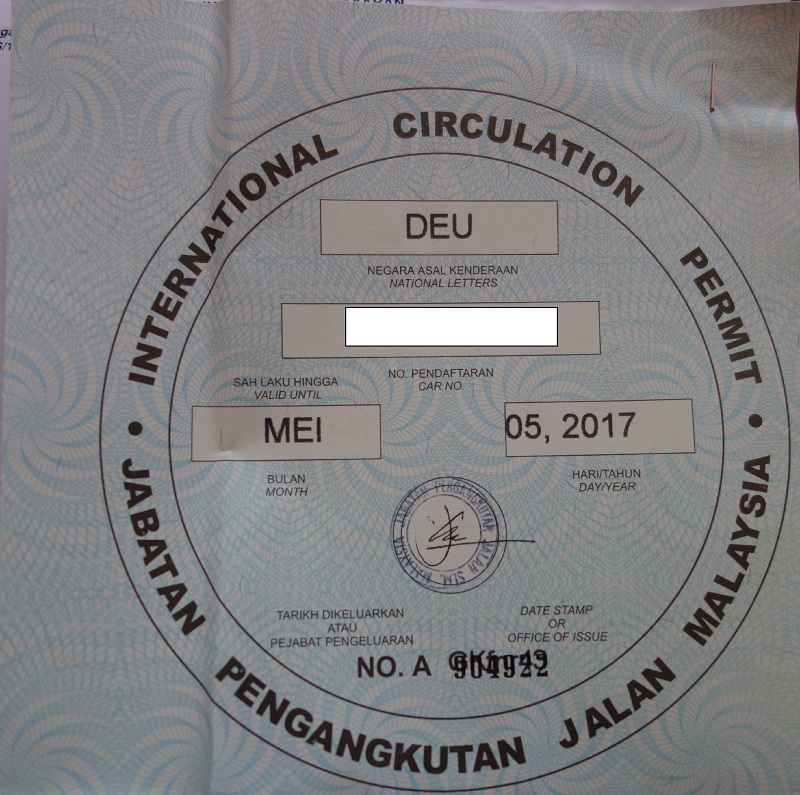 This free of charge document gives permission to foreign registered vehicles using the Malaysian roads officially. Once you shipped into the country you will get the permit at the Ministry of Transport in Putrajaya. Otherwise you can obtain the ICP with your entry at every land border in the customs office easily. If you ship out of the country it will be very likely to be asked for it at the ports customs, so keep that in mind! To receive the permit an insurance is required. It seems that a Carnet de Passage is not necessary in order to apply for the ICP! The permit is valid for 3 months but can be extended under certain circumstances with the approval of the JPJ Director, not exceeding 180 days. 3. The vehicle must possess a vehicle registration validation in Bahasa Melayu or English. 4. The vehicle must be insured by a Third Party insurance (Malaysian-registered insurance). 5. The vehicle must pass the regulations stipulated under the 1959 Construction and Use Rules. 6. The windshield’s transparency must be at a minimum of 70% whereas the side and rear windows‘ must not be less than 50%. 7. The driver must be in possession of a driver’s license that is either in Bahasa Melayu or English. 9. Van and car drivers are required to use the seatbelt. This department will issue you a free of charge ICP at their counter. Therefore a vehicle inspection (PG10) is mandatory in order to issue the ICP’s disk and simply involves the checking of the engine and chassis number. The staff will organize an appointment for you. To receive the permit an insurance is required and can be supplied in the building next door, as described above. The Automobile Association of Malaysia (AAM) in Shah Alam is allowed to issue the ICP permit as well BUT will ask for a 150RM fee and the stamped Carnet de Passage. Everything mentioned before was according to the rules and regulations set by the Ministry of Transport Malaysia. If you like to spend more time or prefer to leave for any other reason your vehicle in Malaysia it needs to be said that you cannot legally extend/ overstay the ICP related 90 days permit, except under certain circumstances!